If you’re a fan of country music, you can enhance your vehicle with the new State of Tennessee specialty license plate which was released on Monday, December 10. The new plate bears a picture of Gibson Guitar Foundation’s ES335 guitar and proclaims Tennessee as “The State of American Music”. Plates can be purchased at County Clerk offices throughout the state for $35 per year. 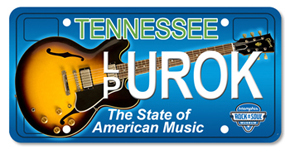 They become the first specialty license plate in Tennessee to benefit music education for Tennessee’s students. No U.S. state even comes close to Tennessee’s musical significance and global influence . . . from the Mississippi River through “Music City, U.S.A.” to the Appalachian Trail, the sounds of Tennessee’s blues, rock, country, soul, rockabilly, bluegrass, R&B, gospel, and other musical influences. Until now, however, unless you are an Elvis fan, a purple cat playing a saxophone offered the only musical option to rock your car’s bumper. “This license plate offers a great way for Tennesseans to provide critical music education to students throughout the state, and a great way to promote Tennessee’s unique, world-recognized musical prominence. Gibson Guitar Corporation and the Gibson Foundation are proud to support this statewide display of musical pride,” said David Berryman, Gibson Guitar Corp. President. Memphis Rock ‘n’ Soul Museum is located at the corner of Third (legendary Hwy 61, “Blues Highway”) and 191 Beale Street at FedExForum, the city of Memphis’ premier sports & entertainment complex. The museum’s exhibition, “Rock ‘n’ Soul: Social Crossroads” was developed by the world famous Smithsonian Institution. For more information on the museum, please visit www.memphisrocknsoul.org.